THE lives of thousands of people across Northern Ireland are being hindered by the impact of a criminal record from their childhood, a leading organisation working to reduce crime has warned. The Detail has spoken to NIACRO, which has been campaigning for old and minor convictions to be wiped from criminal records, and we have examined youth crime data for Northern Ireland. We have also spoken to young adults who say crimes from their past are impacting on their efforts to create a better future for themselves. The age of criminal responsibility here is 10-years-old and low by international standards. A Youth Justice Review, which began in 2011, recommended that the minimum age of criminal responsibility be raised with immediate effect to 12-years-old with a review period of no more than three years in which consideration should be given to raise the limit to 14. In a seperate article today, The Detail examines concerns that have been raised by an independent watchdog over a 75% increase in the number of self-harm incidents at Northern Ireland's Juvenile Justice Centre. Last week, Justice Minister David Ford announced the launch of “a comprehensive scoping study” into how children who may be impacted by the justice system are dealt with. Mr Ford said the study will look at options to reduce unnecessary use of custody by maximising diversionary and community options. Data obtained from by The Detail from The Department of Justice in response to a Freedom of Information request shows that in the two financial years from 2010 to 2012 there were 3,682 convictions of young people aged 10-17 in Northern Ireland’s courts. This included one 10-year-old, four 11-year-olds and 32 12-year-olds. The number of individuals convicted was 2,049. Some will have had multiple convictions. Of the total convictions, 485 were imprisoned while just over 53% (2,214) received a community sentence. Others received a suspended sentence, were fined or discharged. Of those jailed, 25 convictions resulted in a sentence of a year or more. Additional figures provided by the PSNI, again under Freedom of Information legislation, showed that over 4,000 cautions were given to young people in the same age group in the three year period up to April 2014. 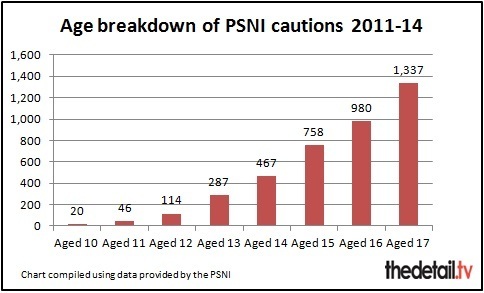 See below for an age breakdown of the PSNI cautions. - The top five categories for cautions were disorderly behaviour (575), theft (496), common assault (437), criminal damage (342) and possession of a Class B controlled drug (283). - 18 cautions were for sexual offences. This included instances of distributing indecent photographs, sexual assault and sexual activity with a child. - One 12-year old received a caution in 2011 for the sexual assault of a child aged under 13. - Cautions for the 10-year-olds were for crimes including theft and criminal damage. Dr Nicola Carr, lecturer in criminology at Queen’s University Belfast, said: “If people truly understood the low age of criminal responsibility there would be wider support to raise it”. She continued: “Dr Siobhán McAlister and I are currently researching young people’s experience of custody in Northern Ireland. The Detail spoke to some young people being supported by NIACRO, a voluntary organisation based in Northern Ireland working to reduce crime and its impact on people and communities. In January NIACRO launched a campaign called ‘Off The Record’ to push for a change in legislation to allow for old and minor convictions to be wiped from criminal records. The organisation is calling for a change in Northern Ireland policy to allow young people and adults to have the opportunity to apply to a multi-agency panel to have old and minor offences committed when they were under the age of 18 removed from their criminal record. It proposed that anyone would be eligible to apply, regardless of their age or how long ago they gained their record. The only essential criteria would be that the individual would have had to be under the age of 18 at the time of the offence. Olwen Lyner, chief executive of NIACRO, said: “At just 10 years old, we have one of the youngest ages of criminal responsibility in Europe, and around 15% of our young people are not in education, employment and training. Thousands of young people enter our youth justice system every year. David (24) was convicted of criminal damage when he was just 14 and he later gained a second conviction for disorderly behaviour. He asked that we don’t publish his second name. Recalling the night he was arrested at age 14, David said: “You’re taken to the police station, you’re young, it’s all new to you, you’re sitting in a cell and you haven’t even got your own clothes on. You just feel like the whole world is coming down on you. “Whenever you’re being interviewed, it’s so formal and you feel like you’ve committed this massive big problem. Then you’re in front on the judge and it’s up to them to basically determine your future. He said that a criminal record “is not something to be proud of” and does impact on job applications. “Recently, I applied for a job in the financial services sector, this job seemed ideal for me and I met the criteria. However, as soon as I disclosed my criminal record the company decided that I was a risk to the business. “I’m more mature now as an adult but the things I did as a child are really impacting on my ability to get somewhere better in life. “I now know the consequences and what the impact of having a criminal record can have on my future. Since working with NIACRO and gaining employment I am constantly trying to better myself. A new filtering process is in place when it comes to criminal record disclosure by Access NI. These new guidelines set out that cautions considered minor or old can be removed from the criminal record check. The scheme was introduced in response to court judgments both in the UK Supreme Court and the European Court of Human Rights. However, a conviction for an offence which falls under the DoJ’s “specified” list will never be removed from a person’s record. According to Access NI there are 1,190 offences on the specified list. These offences can range from quite serious offences (violence against the person and sexual offences) down to those which could relate to relatively minor crimes like criminal damage and public order offences. After the Off the Record campaign was launched, Minister Ford announced his intention to introduce an automatic referral to the independent reviewer for filtering for people whose offences relate to when they were aged under 18. However, NIACRO said that filtering will only make a conviction spent, not take it off the record entirely. It could still be disclosed on enhanced employment checks and visa and insurance applications. Filtering also still does not apply to the specified offences. Further data released to the Detail by The Department of Justice under FoI shows that over the five-year period from 2009 to 2013 there were 3,332 convictions of young people for crimes on the “specified” list. 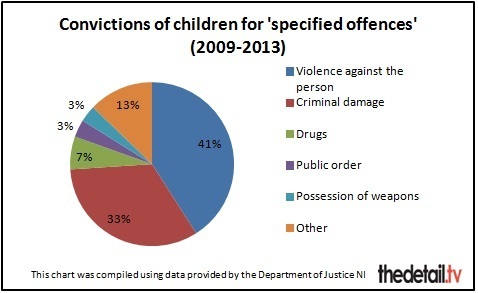 - 41% of the specified offences fell under the category of violence against the person (1,365 young people). - 33% fell under the category of criminal damage (1,100 young people). The Department of Justice data also shows that in the time period 14th April - 30th November 2014, 2,130 criminal record certificates were filtered. This includes cautions only, convictions only and a combination of both cautions and convictions.